Our love for companion animals is more evident today than ever before. We spend much money on their health care. When they pass on we mourn them, and many of us bury or cremate them. The human-animal bond is a strong one. Our dogs are the exquisite ephemera of our lives. They stay for a very brief time and, it often seems, leave us just when the bond is strongest. “It is better to have loved and lost than never to have loved at all.” Losing my darling companion was the most difficult experience of my life. However, all the joy and love we shared was worth it, and I would do it all over again in a heartbeat. We want to do right by our companions as death approaches. Euthanasia allows us to attend to their physical needs. We must understand their emotional needs in order to attend to these. How do animals perceive their own imminent deaths? Do they joyously look forward to the “Rainbow Bridge”? Are they privy to information about a “hereafter” that we are not? Does a “sixth sense” let them perceive things on another plane? My observations tell me, “No”. A friend recently lost her 15-year-old dog. She showed the body to her other dog, his mother. Within a few weeks the second, older dog died. It seemed as if she was grieving, and that this precipitated her own death. There was no sense that she knew that she would see her son again, or that she knew that he was in “a better place”. My experience with my own angel was that she was sad, and then frightened at the end. I gave her a tranquilizer for the trip to the vet to be euthanized, and she “perked up”, despite many obvious signs that her body was failing fast. If I could do it over, I would have asked my vet to keep her tranquilized for the last weeks of her life. These pills may have weakened her and shortened her life. However, the tranquilizer clearly mitigated great anxiety caused by changes, unknown to me, that she felt going on in her body. She could communicate none of this to me. At the end she was just plain scared. Just as you or I would be. Does this mean that I believe that there is no afterlife? Hardly. It is my hope that the world’s major religions are correct, and that there is an afterlife. However, since no one has ever come back to describe it, I believe it is a faith one can hold, and not something one has knowledge of. I think this is true for animals as well. We know animals put their faith in us. This is an awesome responsibility. Beyond this, their spiritual mind sets are unknown to us. I think animals perceive death much as we do -- as a fearsome, unknown change, a loss of control, that one undergoes alone. This implies that their consciousness is, in this instance, very much like ours. Generalize this, and you see that animals feel much the same as we do about most things. They do not want to die “to get to a better place”. They fear the unknown, just as we do. They want the comfort of those they love around them as they do the hard work of dying. I know from experience that living up to this is no easy task. Watching my dog’s decline sent me on many lone, tearful walks and needless trips to the market to escape. If I had it to do over again, I would have stayed with her for every last second, no matter how badly it hurt. She absolutely would have done as much for me. My only excuse for this regrettable lapse is that I, alas, am only human. I was not able to live up to the standard that she set. 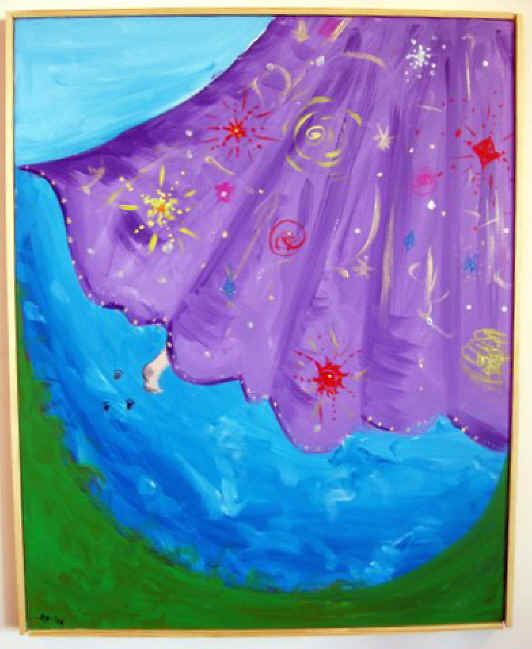 This is a painting by Ellen B. Katcher depicting the ascent into heaven in a beautiful new robe. Note the paw sticking out from under the robe.